The people of Takmao follow the counting of the votes after the polls were closed. While the CPP’s campaign appeared to be rather sluggish and to run primarily through hired claques, the opposing CNRP was carried by a wave of euphoria. In particular, young voters under 25 years of age, who represent at least around a third of the electorate, went against the norm and openly declared their support for the opposition, thereby significantly contributing to a general change in the mood that also ultimately impressed older Cambodians. They were all united mainly by the desire for change (doh) and a transition in personnel: Many people have become weary of Prime Minister Hun Sen, the authoritarian head of government since the end of 1984. Many Khmer associate him with a policy that has completely lost sight of the people’s daily life and that only pursues the interests of the already rich and powerful. For the CNRP, which was formed in 2012, and its predecessors (the Sam Rainsy Party and the Human Rights Party), it has been routine for years to weather social inequality, rampant corruption and the many small and large injustices in everyday life. What was new, however, was that this was now embraced by strong support from the electorate. However, the CNRP’s election campaign included another worrying component: By pandering to the xenophobic resentments against the Vietnamese people living in the country, the campaign undoubtedly experienced an unexpected low point. But the high point of the campaign is also inextricably linked to the CNRP: Their president, Sam Rainsy, was pardoned by King Norodom Sihamoni and returned to his homeland after more than three and a half years of self-imposed exile. Depending on the view point, this happened at the last minute, or – nine days before the election – at the most dramatic moment. Although Sam Rainsy’s active and passive right to vote was further denied, he still successfully completed a campaign marathon through the country in the last week before the election. Not only did he pulverize all political gathering records set in recent years (100,000 people gathered on July 24 alone on his account), but he also impressively showed, despite his long absence, that he remains the undisputed leader of the opposition and is Hun Sen’s only serious challenger. Technically seen, Cambodia’s elections were a farce. A few months before the elections, NGOs had already pointed out massive errors in the voter registration lists. 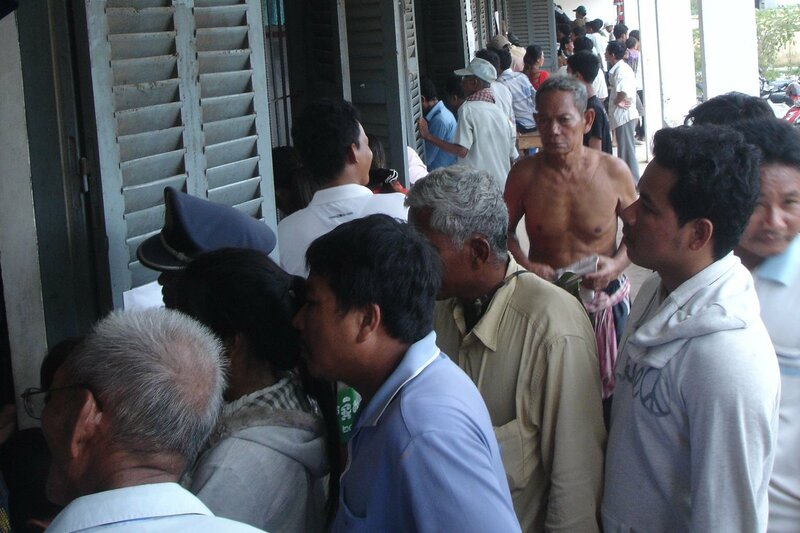 Samples from two independently conducted surveys indicated that probably around one million Cambodians were not registered as voters at all – the opposition even claims that the amount of “disenfranchised voters” numbered around 1.3 million – and an equally large number of people, who were unknown to local residents, were on the local voter lists. Four days before the election, the Phnom Penh Post reported on other serious problems: Particularly that there were far more registrations than voters in the highly contested provinces. Especially affected were the provinces of Kampong Cham, Prey Veng, Kandal and Phnom Penh. In the capital alone, 83 of 96 municipalities were affected – with a total of 145,000 more voters than was theoretically possible. If only that had been the sole handicap: Between the last voter registration period last year and the elections on July 28th, almost half a million special voter IDs were issued. The applications were approved by the respective municipal mayors – 97% of whom belong to the CPP – as a substitute for otherwise necessary identity papers. The CPP supporters are suspected of having voted not only in their own name, but also in the name of so-called ghost voters with the special IDs. Multiple voting was supposed to have been prevented by a special ink in which each voter had to dip his or her finger, but this ink proved to be easily removable – with common bleaching agents that are available in many Cambodian households. Although in early August, the CNRP presented 18,400 complaints that were specifically related to these problems to the National Election Committee (NEC), it already appears that a review of these irregularities will probably not take place. The NEC is generally considered to be controlled by the ruling CPP and shows little willingness to contribute to an effective explanation of the irregularities. They are particularly criticized for not publically recounting the ballots and for not allowing the opposition or other independent NGOs to look at the official registration forms with which the municipalities reported the election results to the NEC. Based on this behavior, in which each decision the NEC announces is in favor of the CPP and credibility is lacking, it appears understandable that the opposition is practically forced to reject the results. The existing evidence for massive election fraud is overwhelming and becomes even more severe in view of the lack of transparency. In addition, there are other conditions – including the fact that the CPP has nearly complete control of all electronic media, used state infrastructure for their campaign, and in particular that they were financed by large entrepreneurs – that still have not been taken into account at all. There is only one thing that we can say with utmost certainty: Had the elections been free and fair, the opposition would have had a clear victory and there would have been a change of power. Despite the CPP’s severe fall from voter favor, which resulted in a forfeit of 22 of their previous 90 seats, Prime Minister Hun Sen continues to sit tight at the reigns, at least within the party. In this case, the erosion of power seems to be a rather long process that has only just begun. Until now, political power in Cambodia has never been awarded through the ballot. In the three decades as head of the government, Hun Sen continued the undemocratic traditions of the previous regimes and even repeatedly demonstrated how extreme his hunger for power and his ruthlessness had become. His ruling principles – particularly the use of violence, threats and intimidation to stir up fear – that had been successful for so long have now reached their limits. At this point, it is still unclear if he is willing to go to extremes, as he did in 1997 and 1998, and use his bodyguard militia. However, he will have to make this decision soon if the opposition holds true to their word and calls for mass demonstrations modeled after those in Egypt. Even if Hun Sen is able to attain formal recognition for these elections in the other domestic institutions (all of which he controls) and abroad, the CNRP still retains considerable leverage: In order to swear in the new parliament, at least 87 of the 123 members must be present. Since the CPP alone does not have the required number of mandates, the formation of a new government could be a long time in coming. In this case, Hun Sen has already announced that the CNRP will be stripped of their mandates and that they will be awarded to other parties. Whether it will now come to a big confrontation, or if the parties will find a solution through negotiations is still quite uncertain. Currently, various scenarios appear possible, and not all promise a peaceful course. In the midst of the unresolved election results, the German Federal Ministry for Economic Cooperation and Development (BMZ) will be navigating towards their regular bi-annual, bilateral government negotiations with Cambodia in late autumn. For some time now there has been criticism from NGOs, among others, on the thematic focus of German Development Cooperation (DC) with Cambodia, particularly due to the ineffectiveness of some sector specific programs. But so far, the federal government has lacked the political will to draw the long overdue consequences. This does not necessarily mean that DC with Cambodia should be reduced, but rather for starters – and already here there are difficulties – the actual conditions on site should be recognized and the irrelevant whitewashing should cease. This requires as a starting point (and not as a secondary accompaniment), a comprehensive, relentless, and in particular, independent analysis of the successes, failures, and potentials of bilateral development cooperation with Cambodia. Only then would it be possible to develop benchmarks with respect to the political and legal developments in the coming years as a prerequisite for effective, bilateral development cooperation. This process is of course accompanied by an analysis of the current political situation after the parliamentary elections and government formation. Whether business as usual can continue, should Prime Minister Hun Sen continue as head of government despite the lack of political legitimacy, is highly doubtful – at least as long as the German government is interested in playing an impartial and above all, credible role in Cambodia, and thereby be accepted by all sides. If Cambodia should become politically instable over the next months, a delay in the government negotiations should not be ruled out. Regardless of the outcome of such a comprehensive evaluation, it should no longer be a secret that a serious rethinking of the existing sector strategy, particularly the support for the land sector, is inevitable. Since the World Bank and the countries of Finland and Canada withdrew their support for developing a cadastre in Cambodia, Germany remains lone partner in this endeavor. The other partners rescinded their commitments based solely on the appalling conditions in Cambodia’s land sector. To this day, it remains unclear as to why Germany’s assessment of the situation is so different and above all, why they continue to financially support the cadastre. The commitment in the area of decentralization does not appear quite as dramatic. However, the inclined observer may ask him or herself which measurable successes have actually been achieved in this sector in recent years. The effort for this political placebo is certainly enormous, and the question as to whether the funds committed here can be better served elsewhere must be asked. In this case, capacity building of qualified educational structures lies far ahead of other issues – and happens to be the topic that is most mentioned by Cambodian partners. The domestic need for skilled workers in technical professions is very high, but an appropriate supply is hardly available. While German know-how in this field is highly valued, the BMZ must no longer hide behind the agreement, allegedly made with EU partners on-site, that states that Germany would not get involved in the education sector. One of the vocational schools run by a German educational institution, flanked by technical cooperation (TC) to set educational standards would also have the advantage of being located in a not so politically sensitive environment. Furthermore, there are other areas in which German support maybe useful. At the top of this list is expanding support for the advancement of women, which up until now has only been given limited consideration (as a “cross-cutting” issue) and has primarily been confined to providing advice to the Ministry of Women’s Affairs. Through the increase of funding, new projects and programs could be established that would, for example, encourage woman in economic activity (known as promoting female entrepreneurs). Furthermore, and in light of global climate change and Cambodia’s high demand for electricity, it appears that measures to generate CO2-neutral energy is also worthy of support. The responsible handling of biodiversity and the protection of natural habitats are also issues where Germany could provide stronger support. A new addition to the agenda could also include integration and migration policy. The election campaign once again made clear how strong the prejudices are that many Cambodians have towards the Vietnamese ethnic minority. So far it has not come to any large, violent clashes, but the last few weeks have shown that this may not be the case in the future. An “honest broker” – i.e. an international actor – could certainly do valuable work in this field, even if a more difficult area is hard to imagine, given the intense feelings of nationalism within Cambodian society. Perhaps the BMZ should begin by supporting initiatives of local NGOs, which deserve much stronger support than they have yet to receive. This manuscript reflects the political situation on August 12, 2013. Dr. Markus Karbaum works as a policy consultant specializing in Southeast Asia and runs the blog Cambodia-News.net. Whether Hun Sen will succeed in achieving this is yet to be determined. While most of the governments in Southeast Asia have already congratulated him on his victory, voices from Japan and China have taken a rather critical stance. The United States has responded with a particularly clear reaction and has at least temporarily suspended their military aid to Cambodia. The European Union and its Member States have yet to take a clear standpoint, most likely wanting to wait until the election process has been concluded before positioning themselves.